Outhouses are a rustic sewage solution for many people. Oftentimes, outhouses are found outside cabins, state parks, or near old homes. They consist of a small enclosure with a seat situated over a “sanitary pit.” Once the pit is full, many people choose to seal it and dig a new pit. In some cases, especially when space is at a premium, the pit is cleaned out and reused. 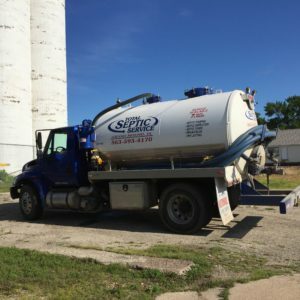 Whatever your outhouse needs are, Total Septic Service professionals will solve any problems you have throughout the Quad Cities, Eastern Iowa and Western Illinois areas. We will save you from a dirty job and get your outhouse back in order quickly. With proper care, you can prolong the life of your outhouse. After each use, sprinkle a layer of ash or lime in the pit. This will help control odors and insect populations. The only two items that belong in the sanitary pit are human waste and toilet paper. Place a small garbage can in the outhouse for other waste. Ensure the methane pipe is clear of leaves, insects, or other debris. Install at least one ventilation airway in the outhouse. Never dispose of any chemicals in the pit; they disrupt the natural bacteria that help break down waste. Fix any structural damage to the outhouse building. Cracks and leaks let insects and vermin in. Leave it to us to complete this dirty job. Call Total Septic Service to schedule your outhouse cleaning today! Servicing the Quad Cities, Eastern Iowa and Western Illinois areas!